PHOENIX – At 22, Carly Verbeke has been to Europe twice. But until just now, she had never been on a hike. 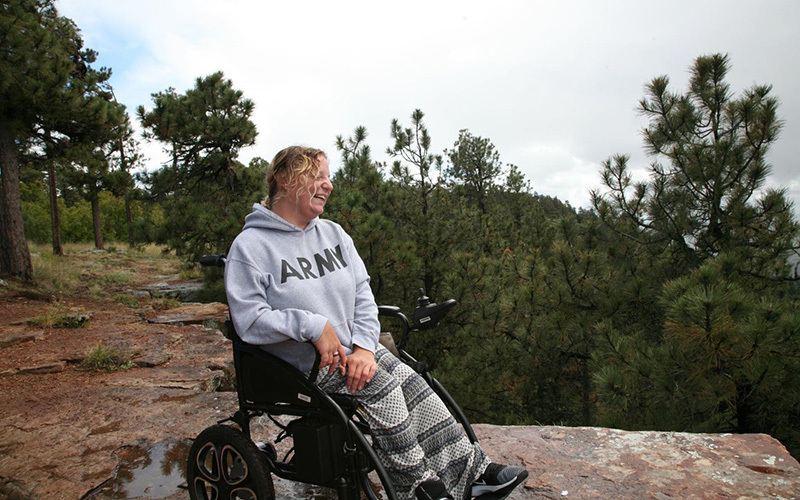 Now, for the first time, her wheelchair is rolling past tall pines on a flat, paved trail, the smell of damp earth heavy in the air. Her chair isn’t even rated to go outside, Verbeke said. 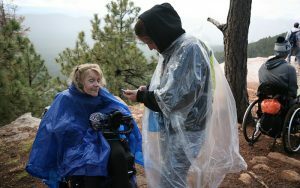 Verbeke, who was born with cerebral palsy, is among a dispersed pack of wheelchairs rolling along the Mogollon Rim north of Payson. Friends, family and aides are walking alongside, and so are a few people with intellectual and other disabilities. It took them about three hours on a shuttle to get here, but Verbeke senses how important this is. “If we’re not able to able to get out here and see it and just reset from the everyday life, then we’re going to go crazy at some point,” she said. “And people just don’t know about it,” said Loren Worthington, talking from a paved, gently hilly trail at Papago Park in Phoenix. He’s with the disability advocacy group Ability360, which co-sponsored the Mogollon Rim hike with a group called Daring Adventures and other partners. These trips are cheap for participants — only $15, including transportation and access to equipment. The idea, Worthington said, is to give people a taste of the outdoors. It happened to Worthington, 54. He has been a paraplegic for more than 30 years, after a baseball accident left his legs paralyzed and his hands partially so. Worthington had loved sports but put all that aside after the accident. He’s in a kind of lounging position, propelling himself by hand pedals, a battery and electric motor assisting him up hills. 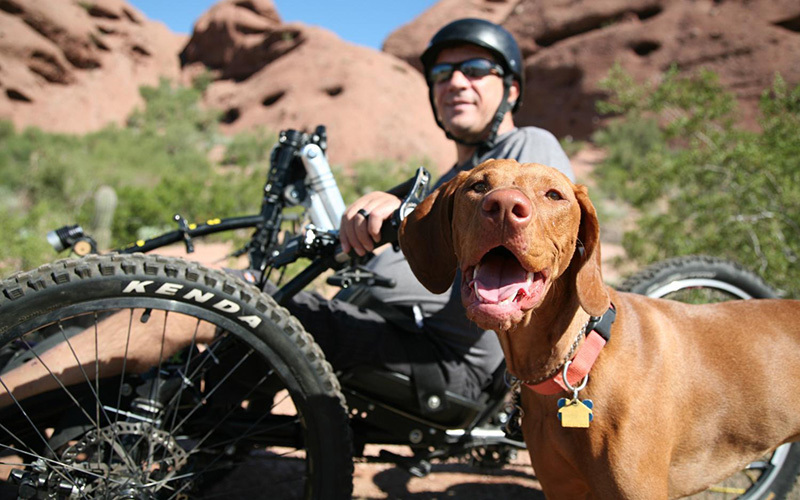 Since buying his hand bike a few years ago, Worthington said, he’s on it every chance he can get, often with his wife and dogs right alongside. With a disability, it’s easy to stay indoors, he said, but if you get people outside just once, things can start to change. Back at the Mogollon Rim, the hiking group rolled and walked their way to an overlook. As Verbeke stared up at the misty sky and down at the dark-green forest hundreds of feet below, she didn’t stop smiling. Wearing a sweatshirt that says “NAVY” and sporting a handlebar mustache, the 74-year-old said he was always the outdoors type before muscular dystrophy attacked his body. But after a few years of depression, he discovered these hikes – and water skiing and kayaking and fishing – the kinds of things offered by Ability360 and similar groups. Sweeden feels his life has opened up. Donna Powers, 53, feels that way, too. She also felt a cold breeze that cut through her, but being here, close to nature, is part of being a complete person, she said. Powers has been paralyzed from the neck down for three decades. Her life has been pretty full, but this is only her second time hiking. And that’s all from going less than 2 miles down a trail.